Nature, 2018, 560(7719):499-503. Linsitinib (OSI-906) purchased from Selleck. 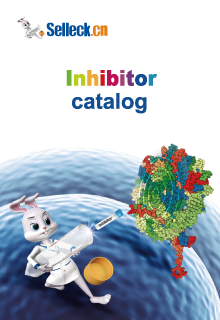 Inhibition of IGF receptor by the IGFR inhibitor linsitinib reduced ERK1/2 signaling activation particularly in U87MG RG7388 resistant cells. Clin Cancer Res, 2018, doi:10.1158/1078-0432.CCR-18-1580. Linsitinib (OSI-906) purchased from Selleck. Cancer Res 2013 73, 834-843. Linsitinib (OSI-906) purchased from Selleck. 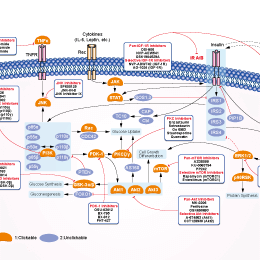 OSI-906 prevents the emergence and inhibits growth of established hormone-indendent tumors . A and B, MCF-7 cells were injected s.c. into athymic mice supplemented with 14-day release E2 pellets. Mice with no tumors (A) or bearing tumors ≥ 150 mm3 (B) were randomized to vehicle or OSI-906 (50 mg/kg/day, per os) for 6 weeks. Data are presented as number of tumors formed ; , P = 0.02, Fisher's exact test (A) , or mean tumor volume ± SEM; P < 0.05 versus vehicle, 2-way ANOVA (B). C, tumor-bearing mice from (A) were treated with vehicle or OSI-906 for 3 days. Xenografts were harvested 4 hours after the last dose. Tumor lysates were precipitated with a p-Tyr antibody; p-Tyr pull- downs and tumor lysates were analyzed by immunoblot with the indicated antibodies. D, tumor-bearing mice were imaged before and 4 hours after the initial dose of OSI- 906 by [18 F]FDG -PET. Images from a representative mouse show [18 F]FDG uptake pre- and post–OSI-906 (T-tumor ). Quantification is shown at the bottom. , P < 0.0001, 2-way ANOVA . Cancer Res 2011 71, 6773-84. Linsitinib (OSI-906) purchased from Selleck. (A) MHM cells were treated with CP (10 μM) alone or in combination with OSI-906 (5 μM) or Erlotinib (10 μM) for 48 hours and lysates were immunoblotted with indicated antibodies. EGFR immuno-precipitates were probed with anti-phospho tyrosine antibody. In lanes marked “Serum Starved”, MHM cells were serum starved for 24 hours and stimulated with EGF (10 ng/ml) for 10 minutes. Lysates were collected and immunoblotted with indicated antibodies. (B) OS cell lines and primary OS cells were treated with CP (10 μM) alone, OSI-906 (5 μM) alone or with CP in combination with OSI-906 for 48 hours and whole cell lysates were immunoblotted with the indicated antibodies. (C) MHM and S4 (CP resistant MHM derivatives) cells were treated with CP (10 μM) alone or in combination with OSI-906 (5 μM) for 48 hours and lysates were immunoblotted with indicated antibodies. (D) IGF1 and IGF2 mRNA levels in untreated cells and cells treated with 10 μM CP for 48 hours were determined by qRT-PCR. The level of each mRNA transcript in untreated cells was considered “1.0” and all the other values were plotted relative to it. Shown are the mean results of three experiments, bars, Standard error (SE). Oncotarget, 2016, 7(19):27511-26. Linsitinib (OSI-906) purchased from Selleck. Linsitinib (OSI-906) purchased from Selleck. Mulvihill MJ, et al. Future Med Chem, 2009, 1(6), 1153-1171. McKinley ET, et al. Clin Cancer Res, 2011, 17(10), 3332-3340. Does the inhibitor dissolve in the vehicle (30% PEG400/0.5%Tween 80/5% propylene glycol) or is it a suspension? OSI-906 in 30% PEG400/0.5%Tween 80/5% propylene glycol is a suspension. GSK1904529A : Dual IGF-1R/IR inhibitor, IC50=27 nM/25 nM. BMS-754807 : IGF-1R, IC50=1.8 nM; InsR, IC50=1.7 nM. BMS-754807 : Phase II for Breast Cancer.